All gaming consoles, handheld devices and operating systems for PC and Mac are equipped with parental control systems, allowing parents to protect their children’s privacy and online safety according to various parameters. – control the level of online interaction (chat) and exchange of data (text messages, user-generated content). Follow the link to find information on finding these setting on different consoles, handhelds and smartphones/ tablets. Here are a series of parent guides produced by National Online Safety around the most common games and apps talked about in school. These are useful, informative and highlight the age-restrictions and associated risks. At present, many children are playing a game called ‘Fortnite: Battle Royale‘. The game is free to download but has a PEGI rating of 12+ as themes within the game are not suitable for children of Primary School age. There are several e-safety issues that may arise when children are playing this game. 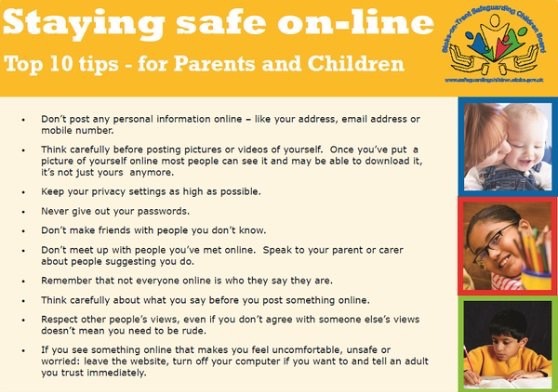 Above is a copy of the guidance for parents from the National Online Safety organisation. How much time is my child dedicating to playing this at home? Do I set any restrictions on the amount of time my child can play a week? Is my child addicted to the game/ gaming? Is my child choosing to ‘game’ over other activities such as socialising, extra-curricular clubs and spending time with the family? Is my child showing signs of frustration/ aggression after playing? Is my child aware of any scams which are associated with the game? Has my child got a strong password? Does my child know how to make a report? In addition many children have their own YouTube channel and we urge you to be checking these regularly.